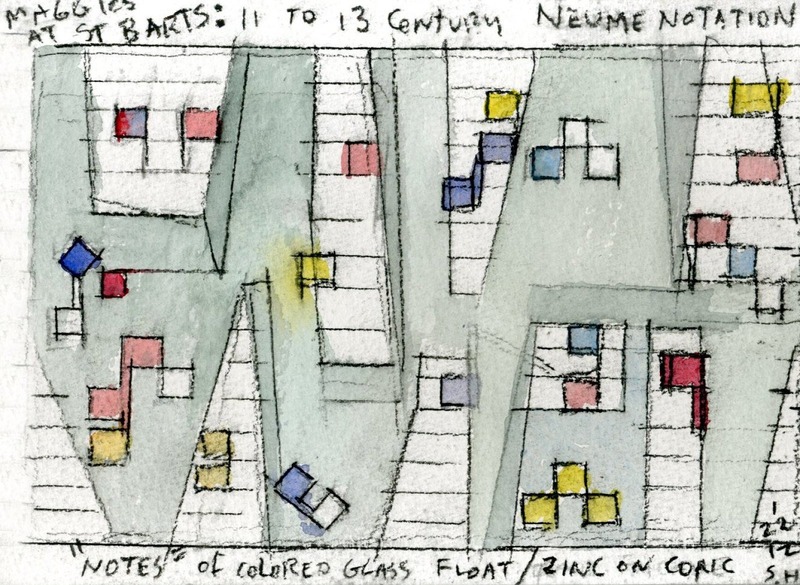 How did Steven Holl change the way contemporary architects think about light? 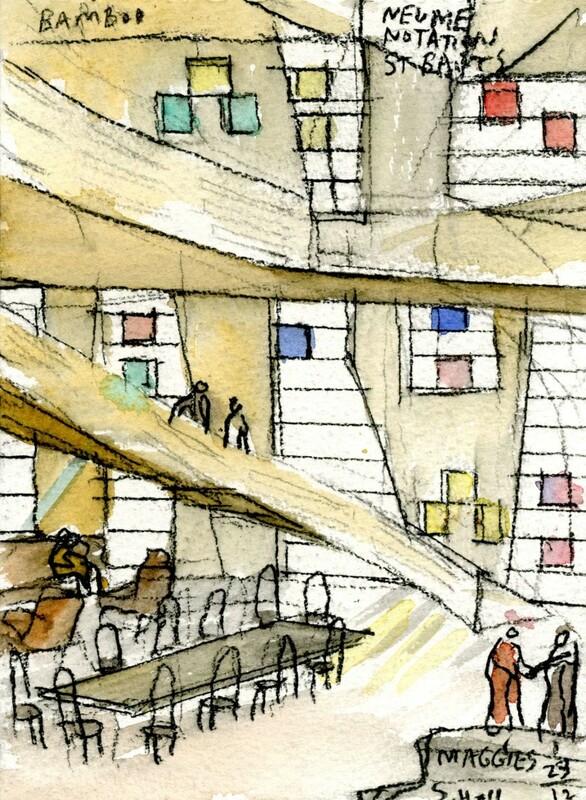 Why begin an architecture project with a painting? What is the connection between a street corner in NoLita and the waterfront in Queens? These aren’t the questions we began with, but a conversation with Steven Holl invites you to rethink your assumptions. Our conversation with senior statesman of modern Architecture, Steven Holl, shed some light on how he is able to think and create in new ways. I believe that architecture needs to be completely anchored in its program and site. Its meaning must be so deeply rooted in the conditions of its inception, it’s unfazed by fashion. Like many of our readers, passing by your Storefront for Art and Architecture forms part of the fabric of my week. To what extent and in what way do you consider the larger city when you set out to design a building? And what about The Storefront in particular? More broadly speaking, what are your first considerations when you begin the design process? I believe that architecture needs to be completely anchored in its program and site. Its meaning must be so deeply rooted in the conditions of its inception, it’s unfazed by fashion. My first book Anchoring describes the relation of a building to a site, to its culture, to its metaphysical origins. If architecture’s original concept can get deeper, rather than broader, it builds a meaning on the site. It fortifies a locus of thoughts and philosophical hopes, or even humor and stories, which are oblivious to whatever style it is. In general, I generate my thoughts through painting. When I draw and paint, I connect the subjective and the objective; it’s a way of open thinking and free-feeling, and it’s unpredictable. I don’t make any restrictions except using a 5”x7” sketch pad. In order to get closer to a dream-like subjectivity, I like to make these little drawings and paintings at dawn before breakfast. Sometimes, if I’m thinking about a building project, these subjective studies open experimental paths to be tested in the studio in rough sketch models by assistants. There is a joy in this way of beginning; it’s inspiring and light, and I feel it’s in my blood. I open my eyes. It’s a new unpredictable day; I have a yearning, and it’s unappeasable sometimes. In the 21st century, we experience and think differently than in any other century. Boundaries and horizons of our fundamental experiences have been expanded and continue to expand. Experiments are now urgently necessary. Although the spatial design is among the least ephemeral, most permanent expressions of culture; it does generate possibilities for exciting experiments. Now that we’ve all had a little while to reflect, what are your thoughts on Bloomberg’s rezoning and development policies, which seem to me to have had the greatest impact on New York’s architectural landscape in half a century? Signing the order to stop the demolition of the Highline was one of the most important acts Bloomberg made in his first month in office. We forget that Mayor Giuliani had signed a demolition order. The Highline, which I have advocated as a public path since my Bridge of Houses project in 1980, is one of the best public space repurposing in decades in Manhattan. Just for this inspiring space we are grateful. The use of light is crucial your work. Can you tell us a little bit about how you go about incorporating light into your designs? For me, light is for space, what sound is for music. The experience of architecture, the overlapping perspectives—it is the equivalent of spatial acoustics in light. If you have a piece of music, you have the score, you have the rhythm, you have some kind of polyphony, you have some kind of a structure, then there is sound that executes and brings it all to life. Otherwise, it is just an abstraction. The same applies to architecture, you have the spatial conception, the conceptual strategy, but none of that is really alive until you infuse it with the light. 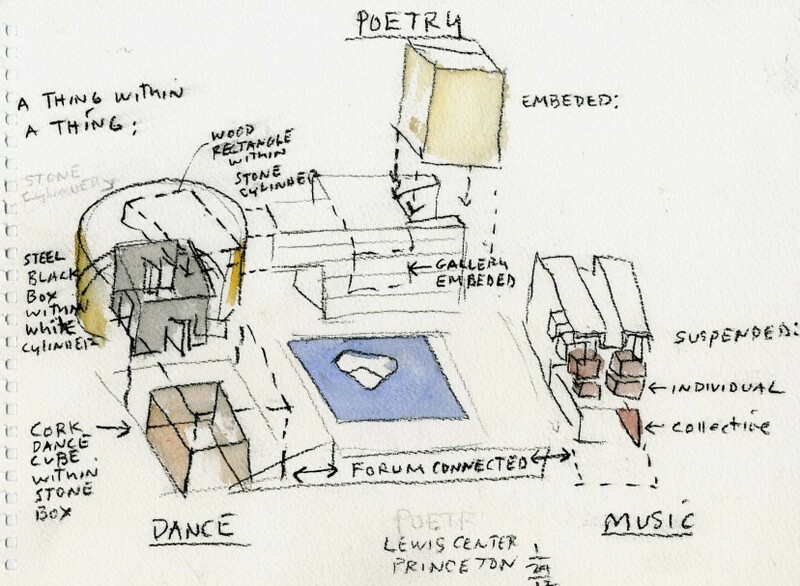 You are working on a huge new project in Princeton; the Lewis Center for the Arts seems almost like a (slightly) scaled down Lincoln Center. What are the specific goals you set out to achieve when working on such a project? 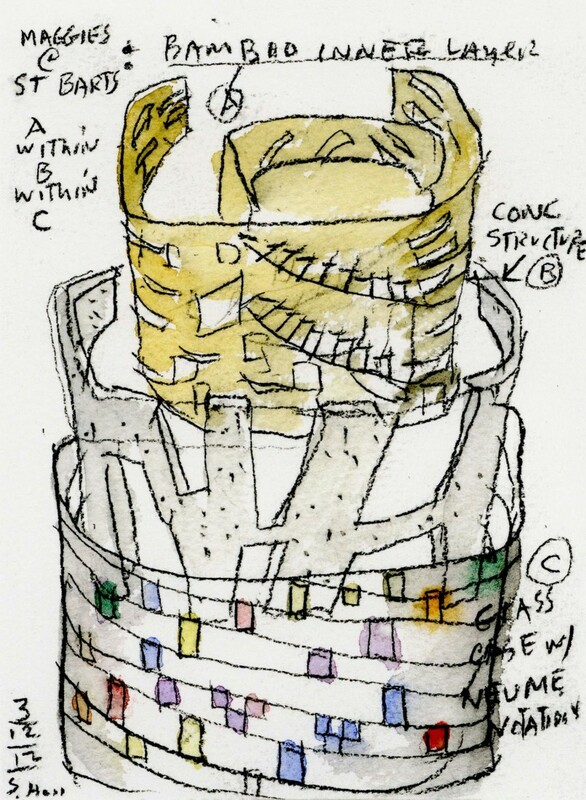 Our first sketches (from 2007) proposed the center as three structures joined by a forum below ground, connecting all three beneath a pool at the “arts plaza.” This new plaza will open to the south, facing the new transit plaza and Alexander Street corridor. 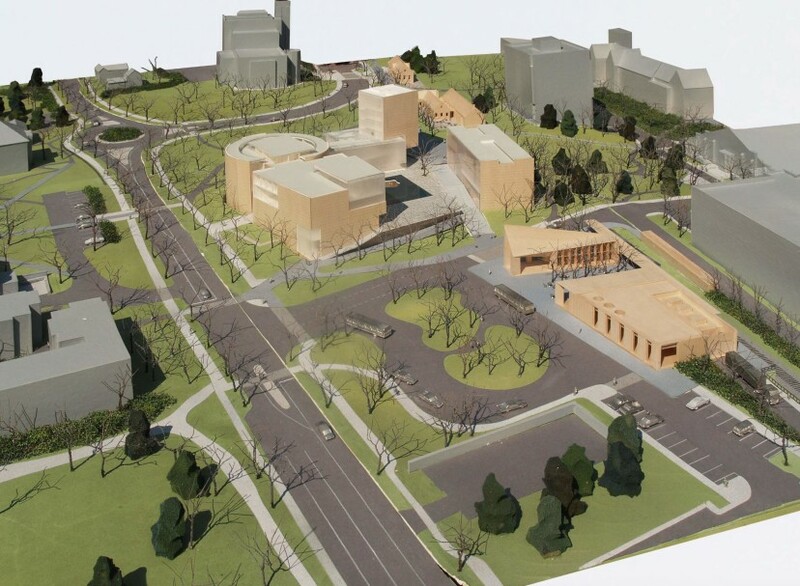 As an open public invitation, this gateway space aims to connect the local community to the University, shaping campus space while maximizing porosity and movement from all sides. Each of the three main structures has an internal concept. The Music Building is developed according to an idea of “suspension”. Above the large orchestral rehearsal room, individual practice rooms are suspended on steel rods. Acoustically separate, these individual wooden chambers have a resonant quality. The Wallace Dance Building and Theater are developed according to the idea of a “thing within a thing”. Within the overall concrete frame, the black-box theatre is comprised of steel, while the dance theatres are foamed aluminum, white washed wood and board formed concrete. A “dancing stair” connects all levels. The third building, the Arts Building, is developed with an embedded concept by its concrete and stone tower connecting to the historic Blair Arch of Princeton’s inspiring campus. 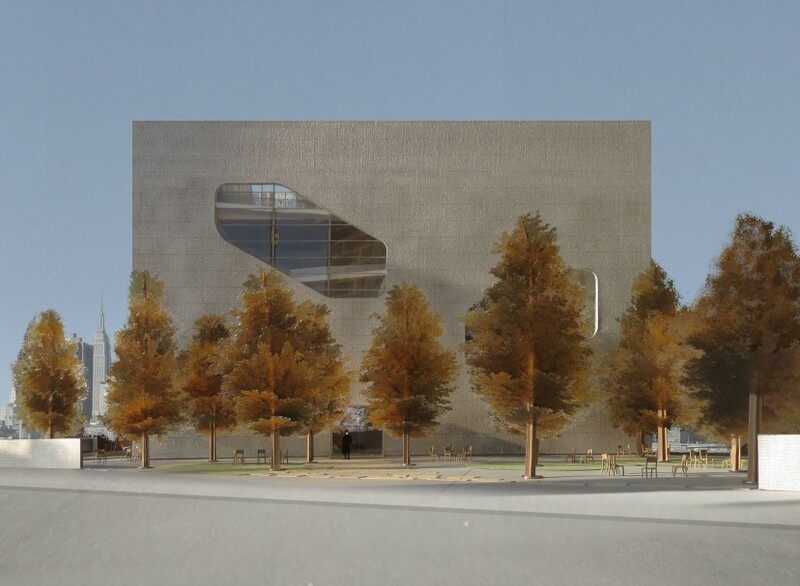 Your forthcoming Hunters Point Community Library design is unique and bold in a way that seems grounded in intention. Can you talk about what your intentions were when you designed it? Located along the East River, against the backdrop of recently built skyscraper condominiums, the Queens Library at Hunters Point will stand as a public building and public park and will bring much-needed community-devoted space to the increasingly privatized Long Island City waterfront. A golden-section upturned rectangle is carved out according to the browsing circuit of movement within the interior of the library. Glazed cuts in the facade grant users views toward the city as they move up a series of bookshelf-flanked stairs. The main Manhattan view, perpendicular to the internal movement of the library, gives visitors to this small space a dramatic experience. The program’s separation into children’s area, teen area and adult area can be read in the sculpted cuts of the east face of the building, one facade opening for each area; yet the programmatic divisions are fluid. 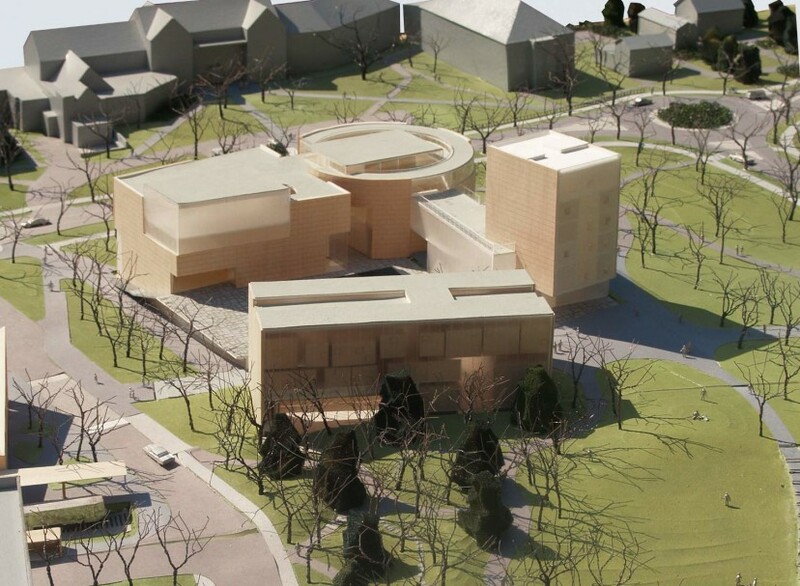 While the plan is compact, the building section of the library is open and flowing allowing for the most energy-efficient design and the greatest amount of public green space on the site. On the east entrance side, the library faces a reading garden bordered by a low park office pavilion with a bosque of ginkgo trees. Ascending the stair inside visitors can reach the rooftop reading garden with panoramic views of the city. There are no columns; the textural concrete structure is the exterior. 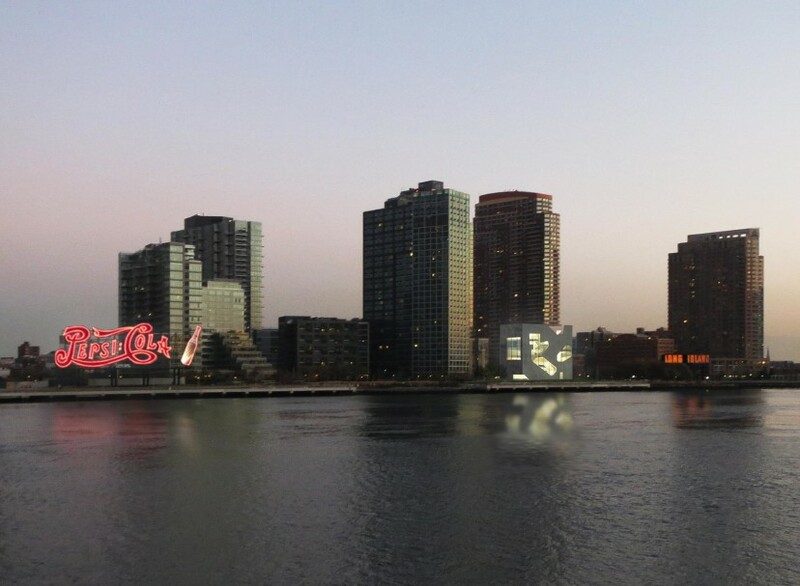 At night, the glowing presence of the new library along the waterfront joins the Pepsi sign and the “Long Island” sign at the old Gantry to become a beacon for this new community place.